Student media reported protests at nearly all of the UC campuses on election night, including UCSD, UCLA, UC Berkeley, UC Riverside, UC Davis, UC Santa Barbara and UC Santa Cruz, with little to no coverage of the reactions of Trump voters, who are a minority at these left-leaning universities. 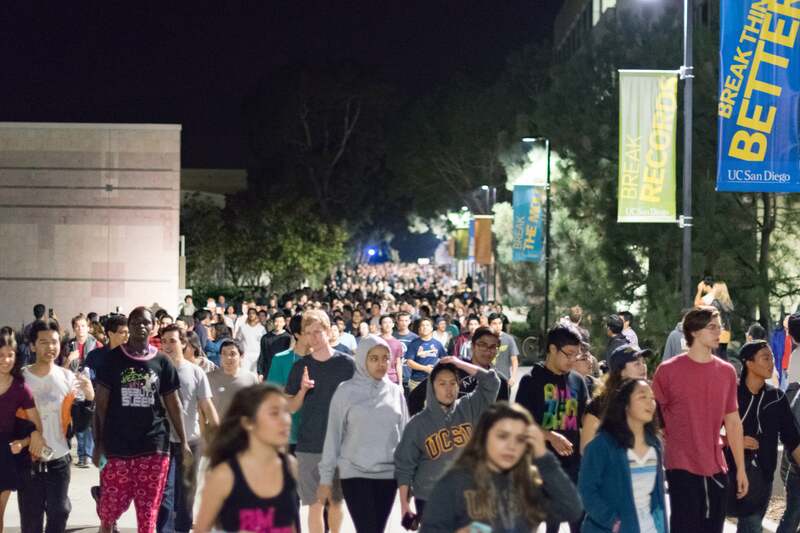 At UCSD, students from all six colleges filed out of their dorm rooms and onto Library Walk in the early morning hours of Wednesday. They marched while chanting epithets against Trump’s new political order, gaining momentum as angered students inflated their ranks. The march, which started on Library Walk and passed through Ridge Walk, Earl Warren College and the Village, continued off campus and onto the Interstate 5 South highway, where a female protester was hit by a car. Paramedics were called to the scene at approximately 1:45 a.m.
A Revelle college freshman who livestreamed the election-night march on Facebook, Garcia told the UCSD Guardian about the mood of the protesters. Garcia also gave her interpretation on why the backlash to Trump’s election was so swift, citing the way the president-elect has singled out minority groups as harmful and dangerous to the well-being of the United States. On Wednesday after the election, many students didn’t show up for class. Matt Jennings, a Thurgood Marshall College senior, was one of them. Professors also felt pressure to address the outcome of the election in their classes. Assistant professor of literature and creative writing Brandon Som restructured his lecture to address the mixed emotions of the student body, offering them a space to vent. “This morning I received multiple messages from fellow teachers asking, ‘What should we teach?’ ‘How should we respond?’ ‘What should we discuss?’” he said in class Wednesday. That afternoon, another demonstration took place on campus after a Facebook event, titled “UCSD Protest: Movement of Solidarity,” gained the support of hundreds of students. The demonstration, organized by Warren College senior Clara Bird, took place in front of the Silent Tree at 2 p.m. Described as a “safe-space event and movement in regards to the results of the 2016 election,” there was to be “no name calling, hateful language, foul language or any kind of violence or dangerous behavior,” according to the event description. Approximately 350 people attended the Movement of Solidarity. Student holds anti-Trump sign at the Movement of Solidarity demonstration. By Thursday, Nov. 10, two days after Trump was named president-elect of the United States, nationwide protesting hadn’t ceased, and was gaining momentum in major cities like Oakland, Los Angeles and New York. Turning to Twitter, Trump blamed the media for inciting the protests. Hours after Trump’s tweet, another Facebook event was scheduled to take place at UCSD. Named “Townhall: Emergency Meeting to Discuss Future Actions,” the event was hosted by Groundwork Books in the Old Student Center, and quickly gained online RSVPs. At the townhall, students discussed topics such as UCSD becoming a sanctuary university and enacting policy that actively prohibits U.S. Immigrations and Customs Enforcement from entering campus property. Groundwork Books will host another townhall next Thursday, Nov. 17. The meetings will be weekly going forward. Grounds, who described himself as “not a Trump supporter, but a supporter of the Republican party,” believes protest is a fitting response to anything that causes public concern, including Trump’s election. “Free speech is a key aspect of our nation’s fabric, so yes, responding with protest is not only justifiable, it is recommended in times of strife,” he said. “They can’t change the election results, probably never will, but they can change their response to the political process and the system we live in,” he added. The refusal to accept the president-elect of the United States is nothing new when looking back at previous elections. After President Barack Obama was elected in 2008, Republicans responded by refusing to accept him as their leader, again favoring the “not my president” theme. But to respond immediately with protest, as we’ve seen in the aftermath of the 2016 election, is unprecedented. Taking note of this, Grounds advocates for level-headed approaches of expressing one’s political views, calling for demonstrators to practice peaceful protest and discussion. 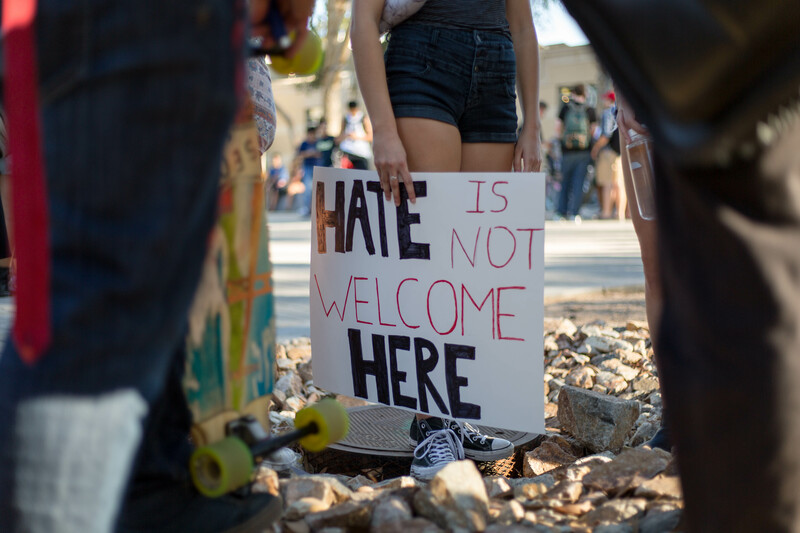 Zeroing in on students as an exceptionally tolerant community, Grounds believes both the never-Trump and the pro-Trump factions have an intellectual obligation to respect one another. Obviously all these children missed school every team the Electoral College was taught. They come across sounding stupid..whiney..spoiled and totally uneducated. This is what happens when you indoctrinate skulls full of mush with liberal crap and rewritten history. I worry about these students. The anti Trump side is being applauded and given cuddles. Yet they are being abusive to those who do believe in Trump. I remember when Gays and Blacks stayed silent on campus. I have to wonder how many of your fellow students voted for Trump but now are in fear of their fellow classmates. Where is your Tolerance then? How are you making them feel? They also have a right to their opinions. Please respect that. As it is the students are now becoming the “Haters” they claim to despise. Us against Them never works. As you young people say I’ve ” been there, done that”. I am old enough to have marched for civil rights. I knew people that Died for their beliefs. You wish to March, March. But not right now. Now is not the time. Your energy is being wasted and not focused. And , I am sorry to say, you are not being listened to. The world sees you as angry spoiled children just acting out. Change that. Stop the protests…for now. When Trump makes a Decision that radically Effects the nation. That the majority of the nation does not like. Then you have a Cause that people can support and the nation will see you as adults . Then you will be effective.